St Helen's Church, Wheathampstead, history. Cruciform in shape, the plan of the present building was completed by the end of the fourteenth century and has remained largely unchanged for the last 600 years. St. Helen's is built of flint rubble, or Totternhoe clunch, with flint facings and limestone dressings. There being no stone in the area, it is thought that the medieval builders used stone from the Midland quarries shipped down the River Ouse to Bedford and from there conveyed by horse and cart along the Roman roads to Wheathampstead. Crowning the tower rises a splendid "broach" spire constructed of wood set at a very steep angle on a square base, and rising to a diminishing octagon. It is clad externally with strips of lead arranged in a herringbone pattern. The present spire is an 1865 reconstruction of an imagined earlier medieval version. The tower is central and dates from about 1290 when the earlier tower needed rebuilding as we know from records in Lincoln Cathedral Registry which tell us of the granting of an indulgence for twenty days to all who contributed to the cost of the work - an early example of the practice so abhorred by Luther in later years. From outside you can see the original corbel table (a row of stone brackets carrying the plinth) with the Edward I buckle ornament. The bell chamber windows are modern. The inventory of 1548 mentioned four bells in the tower. These must have been fairly large, as in 1717 they were recast by Richard Phelps of Whitechapel, with no additional metal, into a ring of six, with a tenor of 17 cwt. In 1885, the second, fourth and fifth bells were recast (probably because they had become cracked) by John Warner and Sons of Cripplegate. By 1936 all the bells and their fittings were deteriorating, and a decision was taken to have them all recast and rehung in a new timber frame with all new fittings. This work was entrusted to John Taylor and Co. of Loughborough. The tenor of the new ring weighed 14¼ cwt., and the bells were tuned to the key of F major. The dedication of the installation took place in September 1937. After some repairs to the tower in 1971, the ring was augmented to eight with the addition of two trebles, cast by the same foundry in 1974. The work in the tower of extending the frame and hanging the bells was carried out by voluntary local labour. The new bells were dedicated in March 1974. To commemorate the induction of the Rev Tom Purchas an entirely new peal was devised and rung in September 1980 - The Wheathampstead Surprise Major. An ambitious scheme of restoration was begun during the early part of the century, the Saxon church having become dilapidated. The energetic Normans decided to put things to rights by first of all rebuilding and lengthening the chancel (c.1238). The east window triple lancets date from this time as do the window and doorway with its dog-tooth decoration on the north side of the sanctuary. By 1290 work on the chancel was completed and the crossing was reached. Money was running out and in order to put up a new tower, the Bishop of Lincoln, Oliver Sutton, granted an indulgence of twenty days to all contributors. Much rebuilding and additional work was done in the early part of this century. Following the rebuilding of the tower, the south aisle of the nave was added and the south porch in 1350. The west end of the nave was rebuilt with its fine doorway and arch with ball-flower ornament c. 1320. The two-light windows at the aisle west end and the octagonal piers with their moulded capitals and double-hollow-chamfered arches are typical of that date. 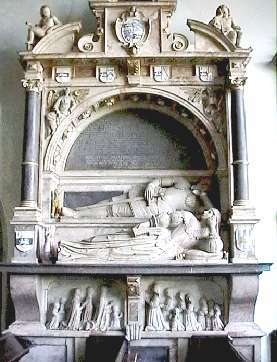 The north aisle was added later, the recessed tomb in the north wall probably being that of a benefactor of this work. The south transept was rebuilt shortly afterwards with its fine east window showing some original fine feather cusping in its tracery and big fleurons. Its south window of four lights with net tracery is of the same date as that in the opposite wall. In the chancel the lancet windows on the north and south walls were replaced and enlarged about 1380, and the small low window at the west end of the south wall of the chancel is of about the same date. The two-storied vestry on the north-east side of the chancel was also added about this time. It was thought by one authority to have housed a hermit or recluse, the upper floor possibly being used as a treasury. The beautiful canopied piscina, or priest's wash basin, to the right of the high altar is the most noteworthy contribution of this period. Again the Macry leopard's head is used in the vaulting of the canopy showing this decorated work to have been the gift of that munificent family. Finally, the medieval improvements to the church were completed with the insertion of the easternmost window in the south aisle with its three cinque-foiled lights. Canon Davys found St. Helen's to be in great decay when he arrived: windows were walled up some feet above the sills, with badly decayed external tracery; the south porch had been filled up level with the ground outside and lengthened to house the fire engine; the north porch had gone altogether, and the only entrance to the nave was by the west door which was covered by a modern porch used to store coal and the sexton's tools. The exterior of the whole church, except the tower, was covered with plaster, and the decaying buttresses had been mended with brick, slate or anything else readily available. Canon Davys aimed to renovate and restore St. Helen's to its original medieval glory, raising the roofs of nave and chancel to their original pitch, and the spire to its ancient proportions. Transept roofs were repaired and decayed window tracery carefully restored. The plaster was stripped from the outside walls revealing the original flint facing. Inside, the seating, flooring and ceilings were restored and a Walker organ installed in the chancel. "Picture contributed by Rodney D Locks." Whoever the artist may have been, for some reason the work was left in an unfinished state, as was the window above. 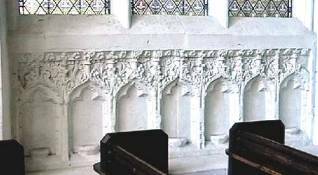 The intended figures were never placed in the brackets intended for them, ……The Victoria County History gives the dates of this transept as between 1330 and 1340. A statue of Apsley George Benet Cherry-Garrard (1886-1959), in his polar gear, located in the north Trancept of St Helen’s church. “Cherry” as he was known was taken as an assistant zoologist to the Scot’s Antarctic Expedition. He traveled with the polar party two-thirds of the way to the south pole. He wrote “The Worst Journey in the World” whilst convalescing after the First World War.